Widen your world with Turkish Airlines! Turkish Airlines has been awarded as the Best Airline in Europe for the 6th consecutive year thanks to its strict compliance with flight safety, reliability, product line, service quality and competitiveness, while maintaining its identity as the flag carrier of Turkey. With unparalleled onboard service, and renowned Turkish hospitality, Turkish Airlines is one of the most preferred leading European air carriers with global network. 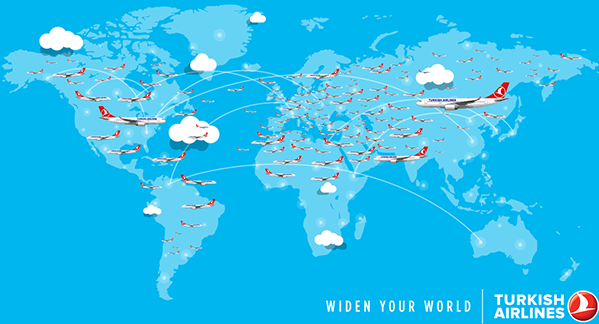 At Turkish Airlines, we fly to more countries than any other airline in the world. We are still continuing with the same excitement on our journey that started 82 years ago with just five aircrafts. As Turkey’s “rising star”, our fleet has now expanded to 298 aircrafts. Seeing as 212 narrow-body aircrafts are starting to filter into our fleet, along with the aircrafts whose lease periods are almost over – our total fleet, including cargo aircrafts, is expected to reach 421 by the end of 2020. Whenever you’re ready to explore our flight destinations, we’re ready to take you there! Discover the features of Turkish Airlines at an affordable price. Choose Economy Class and savor the pleasure of traveling in comfort as you discover our comprehensive meal service, comfortable seating and inflight entertainment system. Enjoy your journey on both short and long-haul flights thanks to the many special features of our Economy Class. Transform your trip to the skies into an incomparable experience. A new definition of hospitality. Whether you want to freshen up and relax before or after your flight, or have time to spare before your connection, we will be waiting for you at Turkish Airlines Lounge Istanbul. With our Lounge Istanbul service, we promise our Business Class passengers much more than just a private passenger lounge. As you wait for your flight departure, you can make use of the massage service, sample some of the dishes that won the Skytrax Best Business Class Lounge Dining award, or entertain yourself and your children with one of our many entertainment options, including cinema, video games, media screens, golf simulator, and children’s playroom. Would you like to enjoy comfort at every stage of your journey? Business Class privileges aren't just for the sky, you can enjoy them on the ground too. Travel in style with a chauffeur-driven, luxury vehicle and make your trip complete with our free Exclusive Drive service. With Exclusive Drive, you can be sure that you'll be at the airport on time or wherever you need to be after you've landed. All you have to do is make an Exclusive Drive reservation 24 hours before your flight departure.